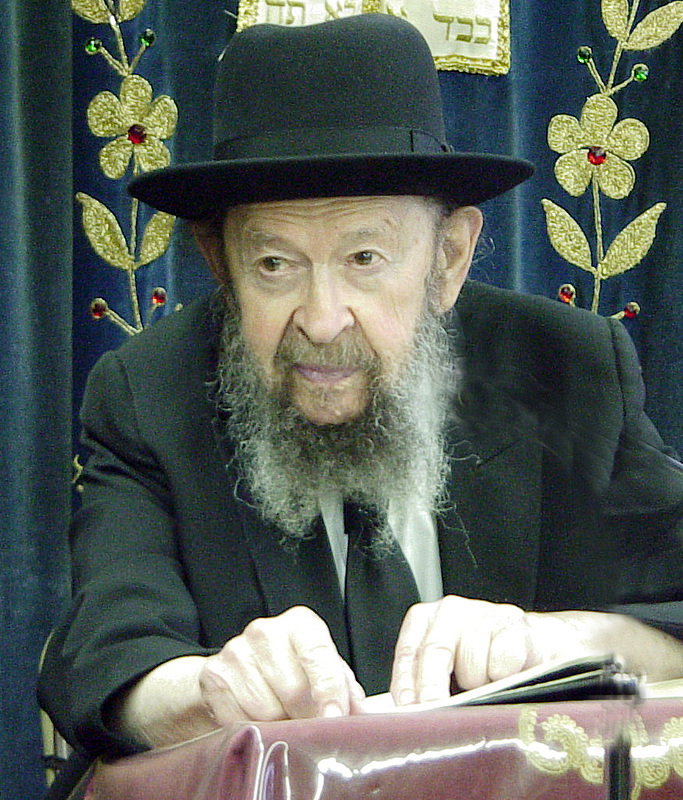 Last Thursday night, the 27th of Nissan, Klall Yisrael sustained an irreplaceable loss with the sudden passing of one of the major Marbitzei Torah of the post World War II Era, Hagaon Hatzaddik Harav Avigdor Miller, zt”l. Rav Miller was one of the tzaddikim that Hashem places in every generation whose influence uplifted a generation, raising it to seemingly unattainable heights of Torah and Yiras Shamayim. He was a trailblazer in Harbotzas Torah, Hashkafa and Mussar. His innovative methods of educating, elevating and reaching untold numbers of Jews have become the norm in our times. As great as he was and as public a figure, he was nevertheless one of the most hidden, private people in our generation. Harav Miller only revealed what he felt was necessary to influence others. Most of his own sublime Avodas Hashem was hidden from the world, including his own family. It is therefore exceedingly difficult to write an appreciation that encapsulates even a small measure of the greatness of this servant of Hashem. His more than nine decades of life were one long expression of the three “Loves” that he spoke of so often, Ahavas Hashem, Ahavas HaTorah and Ahavas Yisrael. They were manifest in his thousands of taped Shiurim, his many books and for those that merited knowing him, they radiated from his day to day conduct. Harav Miller was renown for his amazing diligence in Torah, his Avodah in seeing, recognizing and appreciating Hashem’s kindness, his chesed and his lifelong fight against the various anti-Torah ideas and movements. Harav Avigdor Miller was born more than 92 years ago in the city of Baltimore. His formal Jewish education began with attendance at an afternoon “Talmud Torah” run by his grandfather. There, at a young age, he mastered much of Tanach and throughout his life he would often quote by heart, verbatim some of the most obscure passages in Tanach. The Miller family was extremely poor and Rav Miller would recount how he sat learning in front of the family’s oven in order to keep warm. Even as a youngster his outstanding diligence was clearly evident. He related that the elbows of his clothing were always completely rubbed out as a result of his rubbing them on the shtender as he swayed back and forth for hours reviewing the mesechtas that he knew. At the levaya, his son-in-law Rav Shmuel Elchonon Brog, shlita related how another young Baltimorian several years younger than Rav Miller was indelibly influenced by the sight of the older boy learning and based on the example set by Rav Miller, he chose to dedicate his life to learning. That younger boy was none other than the revered Rosh Yeshiva of Telshe, Hagaon Harav Mordechai Gifter, zt”l. In our day and age, it is impossible to understand the spiritual landscape and tests faced by young American bochurim of eighty years ago in America. Suffice it to say that in Baltimore at that time, there were over 100,000 Orthodox Jews, yet less than a handful of their children remained Orthodox. Harav Chaim Pinchas Scheinberg said that anyone who grew up in America 80 – 90 years ago and remained “frum” is such a spiritual giant that surely Moshe Rabbeinu himself will come to greet him in Gan Eden. Just to gain an inkling of the spiritual wasteland of those days, Rav Miller would always thank Hashem for His manifestation of Hashgacha Pratis, saving his spiritual life. When he was but fourteen years old, the Millers were so poor that upon seeing a “For Hire” sign each day for a month, the young Avigdor decided to take the job. When he came to the store, the owner was taking down the sign. This was a clear Heavenly indication to him that he should continue his learning. Several years later, when he was in his low twenties, he applied to an art school and was rejected because he “wasn’t sufficiently proficient in English”. Anybody who ever heard his amazing command of the language realized the ludicrousness of this allegation. On another occasion, he applied for a teaching position in a Talmud Torah. Despite his proficiency in all of Tanach, he was passed over for somebody who “could not read a passuk straight”. He related his disappointment at each of these “rejections”. Only later did he realize the great kindness that Hashem had done with him by not making him succeed, thereby saving his spiritual future. At the approximate age of fourteen, he journeyed to New York, to the only major Yeshiva of that time, Yeshivas Rabbeinu Yitzchak Elchonon, where he progressed tremendously in Torah and Yirah. He joined a distinguished group of young American Talmidei Chachomim, including Harav Nosson Wachtfogel, zt”l, later Mashgiach of the Lakewood Yeshiva and Harav Yehuda Davis, zt”l, later Rosh Yeshiva of Mountaindale, New York. Already at that young age, he began to base his own Avodas Hashem on the sefer Chovos Halevovos, which never left his side. In addition, he began his lifelong work of Harbotzas Torah, arranging Shiurim in Mesilas Yesharim for a select group of boys. Despite his great strides during his ten years in New York where he drank from the waters of many great Gedolei Yisrael, his spiritual thirst was not sated, he yearned for more. In the 1920’s, Hagaon Harav Eizik Sher, zt”l, Rosh Yeshiva of the Slabodka Yeshiva in Lithuania and son-in-law of the famed founder of the Slabodka school of thought, the “Alter of Slabodka” Harav Nosson Tzvi Finkel, zt”l, came to America to collect funds for his yeshiva. Rav Miller would recount how Harav Sher was not successful in bringing back much money for his beleagured yeshiva. With his comprehensive Mussar Shmuessen, aristocratic personality and personal example, however, he succeeded in bringing back with him much more precious goods, American born yeshiva bochurim who followed him back to learn in Slabodka. Rav Avigdor Miller was among them. He reached Slabodka when he was 24 years old, right before Shavuos. The Yeshiva’s Mashgiach, Hagaon Harav Avraham Grodzinski, zt”l, hy”d, kissed him on his forehead and told him, “you have come to Kabolas HaTorah”. In Slabodka, he was imbued with the unique Slabodka derech in Mussar. In fact, later in life, he would recount how all he said and did was based on the principles he learnt in his six years in Slabodka. He developed an extremely strong bond with his rebbeim there, Harav Eizik Sher, zt”l and Harav Avraham Grodzinski, zt”l. and would hear three, one-and-a-half hour shmuessen a week from them. He would relate how in that entire time, he never once saw even a movement of theirs that was not suffused with the unique nobility of character and honor that characterized Slabodka. Rav Miller was so poor that even in the summer, he would wear his overcoat to cover the numerous patches all over his clothes. While there, he made great strides in learning and became a Gadol in Torah and Mussar. He was one a select group who accepted upon themselves to learn the complete four-hour, afternoon learning session without any interruption whatsoever, not a word other than learning spoken and not to leave for even one minute. While in Slabodka, his greatness was so evident that one of the distinguished talmidim of the Alter of Slabodka, the Rav of the city of Neustadt-Zugind, Hagaon Harav Yaakov Moshe Lessin, zt”l took him as a husband for his daughter Chana Ettil. His two oldest children were born in Slabodka. In the late 1930’s, when it looked like war was inevitable, the Miller family decided to return to America. Rav Miller once related the miracle that Hashem, in His kindness had performed for him by enabling his family together with his in-laws, to escape. His mother-in-law was then unwell and her condition was such that the United States Government would not let her in without her, the rest of the family would not come either. Rav Miller went to the U.S. consulate to see what he could do and lo and behold, the American consul was a friend of his from school in Baltimore. The friend cleared the way for his mother-in-law’s entry. Upon his return to America, he sought a job as a Maggid Shiur in a yeshiva, but was turned down because at that time American Yeshivos only hired European-born Talmidei Chachomim. An American-born Maggid Shiur was considered second rate. His Rosh Yeshiva, Harav Eizik Sher, who had escaped to Eretz Yisrael, invited him to join the staff of his newly opened Slabodka Yeshiva in Eretz Yisrael. Rav Miller turned this offer down because he “had plans for spreading Torah in America”. He soon assumed the Rabbinate in the city of Chelsea, Massachusetts. Besides shepherding his flock, he devoted himself to the chinuch of the children. Despite great adversity, he and his father-in-law founded a Yeshiva where they educated children, many of whom went on to learn in Yeshivos in New York. He would fondly relate how he got his “ticket to Gan Eden” in Chelsea. His thirst to teach Torah spurred him to put up a sign offering to teach Torah to anyone interested in learning. A short time later, a certain Mrs. Kaufman arrived with her son, an older teenager who already worked in a butcher shop. The mother asked Rav Miller to teach her son, still in his bloodied apron, Torah. Rav Miller began teaching him from scratch. After several months, he was able to teach him gemara and the boy eventually became proficient in learning. Mr. Kaufman began to seek out boys from the Chelsea and Boston areas, convincing them to go to Camp Torah Vodaas. Ultimately hundreds of families of Bnai Torah sprouted from these boys, all as a result of a sign inviting anybody to come learn. Throughout his life, Rav Miller would do whatever it took to help people learn. Later, in New York, he would personally sit and write nekudos in the Mishnayos so that some of the unlearned members in shul would be able to begin learning Mishna. After living in poverty for close to a decade in Chelsea, he realized that for the education of his own children he would have to move to New York. Divine providence decreed that on the day of this decision, he received a call from Hagaon Harav Yizchak Hutner, zt”l, Rosh Yeshiva of Yeshivas Rabbeinu Chaim Berlin. Rav Hutner, who had been impressed with some of the boys that had come to learn in his yeshiva from Rav Miller’s yeshiva in Chelsea, was inviting him to become the Menahel Ruchani in his yeshiva. Without much hesitation, Rav Miller accepted the invitation. Rav Miller always expressed “Hakaras Hatov” to Harav Hutner for enabling him to move to New York where his children were able to be properly educated and where he was afforded such a tremendous opportunity to spread Torah. In Yeshiva Chaim Berlin, Rav Miller greatly influenced generations of talmidim. He regularly gave “Vadim”, Mussar discourses to small groups of students. Perhaps more than anything else, he was a living example of complete diligence and immersion in Torah study and Yiras Shamayim. Just watching him impacted his students greatly. He stayed in Yeshivas Chaim Berlin for twenty years and when the yeshiva moved to Far Rockaway, Rav Miller chose not to continue as the commute would take up too much of his day. He also taught for many years in Rav and Rebbetzin Kaplan’s Bais Yaakov where he imparted Torah-true Hashkafos to generations of future Jewish mothers. Just before he left Slabodka, his Rosh Yeshiva Harav Eizik Sher asked him what his goals were. Rav Miller answered that he would like to be like a certain yungerman that knew all of the three seforim written by the author of the Ketzos Hachoshen (very difficult, deep, comprehensive seforim studied in yeshivos) by heart. Rav Eizik said “Nu”. From that point on he began to review by heart the sefer Ketzos Hachoshen. He also gave shiurim in his shul on the “Ketzos” as well as on the sefer “Shev Shmatza” by the same author. Literally, until his last days, he reviewed that sefer. In fact, if he could not fall asleep at night, he would review the Ketzos Hachoshen by heart until he fell asleep. Even in the hospital last week, he insisted that his grandchildren listen to him recite pieces of the Ketzos by heart and would not rest or go to sleep until they had repeated over what he had told them. In Yeshivas Chaim Berlin, he could be seen learning most the day. In fact, during those years, he completed the entire Shas each year! At the levaya, his son, Harav Shmuel Miller, shlita said, “despite my father being world renown as a leading Baal Mussar and Baal Hashkafa, we rarely ever saw him with a Mussar sefer. He was always learning Gemara.” His family members and grandchildren relate that very often there were only certain times in the day that he was available to talk to them. The rest of the day he was closeted in his room, learning. That is simply the way he spent most of his day. He did not attend simchos of even his closest congregants. Even weddings of his own grandchildren he only attended for a short period. He was just too busy learning. When people would invite him to a Simcha, he would often say, “I would really love to come, but I am preparing for a test (that of the Heavenly Court)”. Indeed, just two weeks ago on Chol Hamoed Pesach, he spoke at a family gathering where he told his children, grandchildren and great-grandchildren, “The atmosphere in the outside world is so impure that one must make sure he is constantly surrounded only by ‘Abaye and Rava’.” Even for the writing of his books, which were such an integral part of his Harbotzas Torah, he only allowed five or ten minutes of his daily schedule for writing. He would always advise Bnei Torah that the only way to really succeed is through total immersion in in-depth Torah study. His family member related that whenever they would come to visit him, after short words of greeting, the conversation would immediately gravitate to words of Torah. There was simply no such thing as small talk in his presence. In addition to his position as Menahel Ruchani in Yeshivas Chaim Berlin, Rav Miller assumed the position of Rav in the Young Israel of Rugby in East Flatbush. From the shul, he took almost no salary, declaring that a Rav who doesn’t take money will not be fired, even when his views seem too strict for his congregants. Indeed, he would not budge from this stance, and other than his paltry salary, he did not take any additional monies or presents, even for Rabbinical duties such as selling the Chametz, etc. He was not beholden to anybody and because of that, he felt free to express his opinion about anything he felt did not conform with the proper standard of Yiddishkeit. Even for his books, he would not take any money from sponsors, he financed them from their sales. For sixty years he served as Rav of his congregation. Eventually, in 1975, he moved his shul to Ocean Parkway in Flatbush, where most of its members followed him and it became known as the Beis Yisrael Torah Center. It is hard to imagine that from this small “Rabbanus” of by and large unlearned congregants, the whole face of American Jewry was changed. In the last few decades of his life, he almost never spoke or gave a shiur other than in his shul and once a week in his son’s yeshiva. In the shul, however, he gave over thirty shiurim a week on numerous topics. Every morning and evening, weekdays and Shabbos, winter or summer, his shiurim continued. The only slot he once said he regretted not filling with a shiur was Friday afternoon before Mincha. In the shul, he finished Shas with the Shiurim and many mesechtos were repeated time and again. He had special means of testing his congregants to make sure they would remember what was taught. Many who had very minimal formal background in learning became great talmidei chachomim and experts in Shas. One congregant who had not been fortunate enough to have a Jewish education, began to learn Gemara very late in life. Rav Miller encouraged him and when he complete his first three pages, Rav Miller commanded him to make a siyum in a catering hall with china, linen and roses for his wife in celebration. This man eventually became a talmid chachom, even making a siyum on Shas. Rav Miller continued giving his shiurim until this past Shivie Shel Pesach. The shul, which was never very large, was where all of his many innovations for Harbatzas Torah that reached Jews in all corners of the world began. He was one of the first to use the vehicle of cassette tapes to spread Torah. His thousands of Hashkafa tapes spread throughout the United States, Australia, South Africa, Europe and Eretz Yisrael. All segments of Jewry became his talmidim, whether Ashkenazim or Sephardim, Chareidim or Lithunian Yeshiva graduates, those born frum or baalei teshuva. Rav Miller’s Hashkafa and Daas Torah espoused in his tapes and seforim became their guidelines. He was a trailblazer in innovative methods in Jewish education. He was among the first to write books in English to propagate Torah. Many years ago, while on a walk, he looked up at the telephone wires and said to the person accompanying him, “Those wires will be used to be Mekadesh Shem Shamayim. We will set up people with chavrusahs over the telephone, bringing many people closer to Hashem.” This comment was made and implemented long before the telephone chavrusa programs became accepted. To display for one and all Hashem’s infinite daily kindness became his life’s work. He used the example from Sefer Chovos Halevovos (Chapter of Shaar Habichina) where the author points out all that we have to be thankful for. He would constantly talk about seeing Hashem’s kindness from nature, about the apple, the orange or the banana. He would show Hashem’s kindness in making a banana an unappealing shade of green and difficult to peel when unripe because it is unhealthy. When it becomes ripe, it changes to a delightful yellow color, beckoning one to open the readily peelable peel and partake of the fruit. Hashem made the apple red and beautiful just for our enjoyment. He gave countless examples and never tired of pointing these things out, constantly renewing and reiterating the sense of happiness derived from these manifestations of Hashem’s love for us. Indeed, he always kept apple and orange pits in his pocket, so that “If I forget that Hashem is my best friend, I can feel them and remember all the kindness inherent in an apple and orange.” He would even dedicate an entire shiur to a watermelon pit. Among other things, he would point out why Hashem made it moist, so that we can easily spit it out. If he ever felt for a second that his love for Hashem needed strengthening, he would walk into a fruit store just to observe the great wisdom of Hashem and His kindness inherent in each fruit. He would enjoin his listeners to recognize Hashem’s kindness and feel close to Him, by actually visualizing these things and repeating day after day, “I love you Hashem”. This advice was not just a superficial action, but one meant to change the whole person’s essence, to make them realize the kindness of Hashem. In this way he constantly proclaimed his love for Hashem and His people. Other times he would think about the importance of each Jew and would bless them. Countless Jews in Flatbush recall being blessed by Rav Miller during his walks. He would walk by a mother wheeling a baby carriage and would bless her and her baby. He would walk by the Mir Yeshiva, which was on the same block as his house and shul and he would stop and say the Yeshiva, Roshei Yeshiva and bochurim should be blessed. Even that, however, was not enough, he had to repeat each bracha that he gave. For example, if somebody came to inform him of the birth of a baby or another simcha, he would respond with a warm Mazal Tov and a bracha. After the person left, he would bless the person with Mazal Tov again because the first time it was done reactively, by rote. Even “a Gut Shabbos” would be repeated so he could think and feel what he was wishing the other person. Whatever others saw of his Avodas Hashem, was only a small fraction of what he really was. Being a student of Slabodka, tznius in Avodas Hashem was an absolute prerequisite. He only displayed what others needed to learn from, but by and large he kept himself hidden, even from family. When still in Slabodka, he asked the Rosh Yeshiva how he could acquire the middah of loving a fellow Jew. His Rebbe told him to randomly pick one person and decide to do kindness with him. He picked a butcher from Slabodka, a simple person and did whatever he could to help him and his family. Even in America, many of the Seforim he wrote are written and published L’ilui Nishmas Yisrael ben Aryeh Eichenholtz, that butcher. He also donated sets of Shas to his own shul and to many leading Yeshivos in America in this person’s memory. All part of his love for his fellow Jew. For years, he would put a nickel in the pushka each day as an expression of appreciation to his family pediatrician, a non-religious Jew, who was devoted to his patients. He spoke thousands of times on many different topics, yet he never said anything that he himself was not holding by. Some people practice what they preach, he on the other hand preached what he practiced. He had iron self-control and discipline, even over his own emotions. A few months ago, when one of his closest grandsons was tragically killed in a car accident, he said a hesped that afternoon, declaring that his life would never be the same. That night was Thursday night, the night of his famous Hashkafa Shiur which was always taped and dispersed world over. He gave a shiur just like all other and there was absolutely no sign, neither on his face nor in his demeanor, of the tragedy just sustained by his family. His davening, too, was hidden. He almost did not shake at all during davening and only by observing the bulging veins in his neck and temple, could one discern the supreme effort he invested. He accustomed himself to daven at a certain pace and enunciated each and every word clearly and concisely. The part of davening that took him a bit longer was the bracha of Yotzer Ohr, thanking Hashem for light. He would say that everybody wakes up and becomes aroused at the end of the bracha when we ask Hashem to shine a new light of Tzion and bring Mashiach. However, the beginning of the bracha, when we thank Hashem for the amazing bracha of light, which is such an integral part of life, is taken for granted. The iron self-control of this Mussar personality was evident a few years ago when he had to undergo heart surgery. He was almost ninety years old at the time. Before the operation, he said the long Viduy and Shema said before one’s death, as plainly and simply as he davened. He was ready and had been preparing for this his entire life. Another amazing facet of Rav Miller’s personality was his constant battle against the many different forms of idolatry that steered the unlearned Jews away from Hashem and His Torah. He once said that he studied evolution for 74 years to show what a foolish concept it was. He devoted many pages in his books to exposing its falseness. He would constantly say that evolutionists have the ultimate “blind faith” because despite all of the evidence against evolution, they are afraid of the obligations that would be thrust on them if they acknowledge Hashem’s presence. He was an expert in all of Tanach, knowing it almost by heart. He received permission from one of the Gedolei Yisrael of the previous generation to study other religions so that he could stand up against apostasy and prove them wrong. His books on Emunas Hashem and Torah, completely, logically and convincingly prove that Emunah in Hashem is truth and he clearly shows the fallacies and falseness of other religions and schools of thought. Rav Miller constantly railed against all abominations of what became accepted as the norms of American lifestyle and fought an uncompromising battle against them. He consistently encouraged his followers to do their civic duty and vote for the party and politicians that espoused more conservative values. He held that liberals destroyed the moral and social fabric of society and were an open campaign of rebellion against Hashem. He wrote books on Jewish history, showing how all world events were put into place by Hashem for the sake for the Jewish nation and constantly strengthened Emunah with is clear analysis of world history. In spite of his comprehensive secular knowledge and that almost all of his shiurim were given in English, he firmly demanded that his family members speak only Yiddish. He felt that Yiddish was a shelter from the impurity of the outside world. He was extremely particular about what his own children read and every book brought into the home was scanned by him (he literally stood on one foot so that he would not get too involved) to make sure it was acceptable. In the early years of his Rabbanus in Flatbush, he did his best to fight against the lax atmosphere with regard to halacha that permeated America at the time. He would send his children and children from the shul to hang signs in the streets if he saw a store’s kashrus was unacceptable. After Pesach, he would publicize which stores had not sold their Chametz so that Jews would not unknowingly but from them. Even though his signs were often ripped down, he never backed off. He would also make sure that the local bakeries did not start baking Chametz before Pesach was over. Close to two decades ago, he founded Yeshiva Beis Yisrael in Flatbush together with his son, Harav Shmuel Miller, shlita. He became the Yeshiva’s Menahel Ruchani and attended the daily Mussar Seder. He also gave regular Mussar Shmuessen that were attended by Bnei Torah from all over the city. His influence permeated the Yeshiva and he derived great satisfaction from its success and positive influence it was having on so many people. Harav Avigdor Miller was instrumental in lifting up an entire generation to lead a higher, more spiritual existence. He was not affiliated with any political organization nor with anybody and therefore he was affiliated with all segments of Klall Yisrael. Everyone felt that he was theirs, and he became one of the few people in the generation that was a Rebbe to all of Klall Yisrael. The next hespedim were given by the Novominsker Rebbe, Harav Yaakov Perlow shlita, his son-in-law Harav Yerucham Leshinsky, shlita Maggid Shiur in the Mir Yeshiva, a grandson, Harav Simcha Bunim Cohen, shlita, Rav of Khal Ateres Yeshaya in Lakewood, New Jersey and Harav Yosef Harrari Raful, shlita, Rosh Yeshiva of Ateret Torah. Rav Miller had a colossal influence on the local Sephardic community. The last Maspid was the successor as Rav of his shul, his grandson, Harav Eliyahu Brog, shlita. The massive procession moved slowly down Ocean Parkway and made its way to Yeshiva Beis Yisrael on Avenue J and Ocean Avenue where it stopped on its way to Kennedy Airport and Eretz Yisrael. On Monday in Eretz Yisrael, the levaya held outside the Mir Yeshiva was attended by thousands. Hespedim were delivered by Hagaon Harav Mattisyahu Saloman, shlita, Mashgiach of the Lakewood Yeshiva, Hagaon Harav Moshe Sternbach, shlita, Dayan in the Bedatz Eida Hachareidis, Harav Shmuel Yaakov Bernstein, shlita, Rosh Yeshiva of Yeshivas Chevron – Geulah, Hagaon Harav Baruch Rosenberg, shlita, Rosh Yeshiva of Slabodka, Hagaon Harav Nosson Tzvi Finkel, shlita, Rosh Yeshiva of Mir Yerushalayim, Hagaon Harav Meir Tzvi Bergman, shlita, Rosh Yeshivas Rashbi, Bnei Brak, his son Hagaon Harav Shmuel Miller, shlita, his son-in-law Harav Hershel Kanarek, shlita, Menahel of Yeshiva Ohr Hameir in Peekskil. He leaves behind his devoted Rebebtzin, his oldest son Reb Eliezer Miller, one of the distinguished members of the Flatbush community, his son Harav Shmuel Miller, his son-in-law Harav Shmuel Elchonon Brog, his son-in-law Harav Yerucham Leshinsky, his son-in-law Harav Hershel Kanarek and more than 100 grandchildren and great-grandchildren, all yereim v’shleimim, many of them distinguished Rabbanim and Talmidei Chachomim.